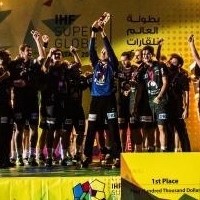 For the second year in a row, Füchse Berlin have sensationally defeated the favourite to claim the IHF Super Globe title in Doha, Qatar, on Thursday night. After 60 highly entertaining and thrilling minutes, the 2015 EHF Cup winners came from seven goals behind to beat Paris Saint-Germain 29:28 (12:15). VELUX EHF Champions League winners Vive Tauron Kielce took the bronze place by beating Doha based tournament hosts Al-Sadd. 2015/16 VELUX EHF Champions League top scorer Mikkel Hansen and the Karabatic brothers had made their mark in the first half of the final by scoring nine of 15 PSG goals, and Paris even managed to forge ahead to 22:15 to seemingly end the contest with just over 20 minutes left to play. However, Berlin struck back, with Iceland’s Bjarki Elisson on fire. Thanks to him and his Scandinavian teammates Zachrisson and Tönnessen, the Foxes went on a 7:1 run to close the gap to one goal with 13 minutes left on the clock. PSG momentarily found their rhythm once again, but Berlin could not be stopped. Turning a 23:26 deficit into a 29:27 lead by the final minute, which was enough to defend their title against the favoured French side. “We will invest our prize money in our youth teams and our future,” said Hanning after the award ceremony in the shower of confetti in Doha, while Super Globe debutants PSG were obviously unhappy when receiving the cheque on the podium and again missing out on their first international trophy. In the previous match, Kielce had finished their first appearance at the Super Globe successfully after losing the semi-final against PSG. After an evently-fought opening 20 minutes, the Polish champions all but decided the match after opening up an eight-goal margin. Their lead extended to 13 goals at one point, before Kielce settled with a 36:25 win. All court players found the back of the net and it was Serbian new arrival Darko Djukic who lead the scoring with seven goals, while another newcomer, Croatian goalkeeper Filip Ivic, produced an outstanding performanc with 16 saves.